Previous PostCorvette: What Is It And Why Does It Exist?Next PostPhilippine Navy Frigate Program: An OPV by Any Other Name? Excellent article on a subject I’ve been trying to get across to the US Navy and most other world navies especially the navies of emerging countries who don’t have big budgets but do have big maritime crime problems. We’ve taken the OPV to a new level by designing them on a high speed catamaran hull platform with a host of other innovative performance enhancing features. Where these vessels excel is that we build them in production molds using carbon fiber. Building them in productions moulds takes a matter of weeks to complete and this saving of man hours bring the price down to where they are competitive against metal OPV’s that take months of man hours to hand weld. Carbon fiber excels as it is five times stronger than steel and less than half the weight of aluminium. The light weight is key to its success as it allows us to use smaller engines that cost less, weighs less and uses less fuel which allows them to outperform all metal OPV’s by cruising at 35 to 40 knots using 75% less fuel than steel OPV’s. Our present production models come in four sizes 65’ & 85’ x 30’ and 105’ & 115’ x 35’ with larger custom sizes available. Armament options include two 50 caliber MG and/or two Bushmaster M242 other options are available. Excellent article I would point out that OPVs should be larger because in my mind they can be better logistics support ships. Many designs are based on commerical OSV/OPV/OSCV ship types providing more capacity. And larger OPV could be better aircraft platforms as well as having space and power for larger sensor systems. 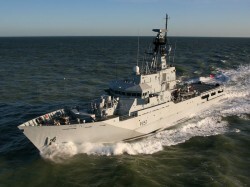 The cost to convert or upgrade an existing OPC design is FAR LESS than building any new construction warship or cutter. I do NOT see speed as a rqmt of OPVs but rather endurance is key metric. Using a size formula to fit this new type in-between corvette and frigate is probably NOT a good comparison because again they are intended for lower Phase order missions, complimenting rather than supplementing warships. Depending on the nature of the mission and operations, OPVs can make outstanding platforms for off-board MCM systems, can provide a close inshore resuscitation facility for wounded, and can provide ‘lilly pad’ flight decks to extend the range and/or endurance of helicopters operating from other vessels (especially if the available landing platforms are LPDs without a full-length flight deck, limiting the number of aircraft they can launch). In some scenarios they could.also be used to insert SF teams (speed is not always necessary), and they could serve as outlying pickets to guard the main force against attack by small fast craft. Depending on their radar and depending also on the types of SAM available, they could even help thicken the air defences by embarking modular SAM launchers. . The key is to understand them (and design and build them) as multipurpose platforms from the outset, with lots of deck space and spare internal volume. Building too small is in any event silly: It does not save a lot of money and greatly limits the ship even in its primary peacetime role once seas get up a little. What was the old RN saying, ‘steel is cheap and air is free’? As long as one does not want to push the speed envelope or has a specific issue with needing to enter very small ports, it makes sense to go bigger.